The Port of Sydney Development Corporation has a mandate to manage and develop the largest port development opportunity in eastern North America: the Port of Sydney, Nova Scotia, Canada. The Port of Sydney’s wide development mandate includes the harbour and the development of its infrastructure, including marine, truck, rail and air transportation services. The development mandate includes facilities contributing to or engaged in the movement of commercial goods through the seaports, highways, railroads and airports and all complementary and support services. The Port of Sydney is located on the east coast of Canada. The Port’s 16.5 metre deep channel and sheltered inner harbour can welcome the world’s largest vessels. The Port of Sydney is positioned on direct shipping routes to Europe, USA, South America and Asia. 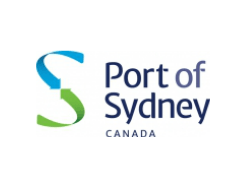 The Port of Sydney is the first port-of-call on mainland North America for vessels transiting the Suez Canal and a “Gateway to the Great Lakes”. With sea, road, rail and air transportation, our multi-modal options allow for shipping and receiving flexibility. The beautiful Joan Harriss Pavilion is situated on the Sydney waterfront and is within walking distance of Sydney hotels, restaurants, shopping centres and boutiques. This versatile and adaptable space can accommodate various layouts and events, such as a concert, convention, trade show, wedding, press conference, meetings, etc. The unique features and flexibility of the Pavilion are sure to make your event a memorable experience. The Port of Sydney is Canada’s ocean gateway to the world renowned destination of Cape Breton Island, and that’s why it is now a selected destination for many prominent cruise lines. With its gracious and proud people, rich Gaelic heritage and sweeping landscapes, a visit to the Port of Sydney and Cape Breton Island creates a spiritual awakening that is sure to captivate you and keep you longing to return. Whether it’s driving around the World Famous Cabot Trail, taking a stroll through the year 1744 at the Fortress of Louisbourg, sailing on the placid water of the Bras d’Or Lakes, visiting the home of Alexander Graham Bell, viewing the World’s Largest Fiddle just a few feet from the ship, or taking in a traditional Ceilidh at the Joan Harriss Cruise Pavilion, the Port of Sydney presents an opportunity for rewarding and diverse experiences.